I had a nominal interest in food during high school. I think. Most of the time, I recall subsisting on Diet Coke, coffee and tea, but I do remember taking on some cooking responsibilities after my mom decided she just wasn’t going to cook every night anymore (who could blame her). However, it wasn’t until the summer after my freshman year at college when I was living at home, dumped by my boyfriend, and employed at possibly the worst summer job ever – pulling the staples out of used airline tickets so they could pass through a “machine” (this was 1990) – that I got into baking bread. I admit to having had hippie tendencies back then. I was a vegetarian, working my way through the Moosewood Cookbook and Laurel’s Kitchen. I had always romanticized the idea of bread baking, but had no direct experience in the matter. If I was going to make a loaf of bread, I decided it should be whole wheat (obviously), so I went to the supermarket, bought a bag of whole wheat flour and used the recipe off the back of the package. As I remember, the recipe called for shortening. Despite the ingredients and after a few false starts, I got into the groove. I loved making bread. I loved kneading bread. It was meditative while at the same time productive. I was bad at pottery, but good at making bread. It got me through a miserable summer. When I returned to college that fall as a sophomore and lived in a food co-op (a place where many a bad batch of hummus came into the world), I focused on the bread. Whole wheat and challah. While I have dabbled in other breads – shortbread, irish soda bread, and the now infamous 27-hour no-knead bread, I still find a lot of pleasure in making the basic whole wheat loaf. In the past few years, as my girls are a bit older and less physically attached to me, I have resumed the routine of weekly bread making (not all weeks, but many). I have replaced my old recipe with a new one that calls only for flour (white + whole wheat), yeast, honey, butter, salt and water. The simplest of ingredients. Put the warm water in a large bowl, add the yeast and 1/3 c. of the honey (saving the remaining 1/3 c. for later). Next add 5 cups of bread flour (one cup at a time) and mix. 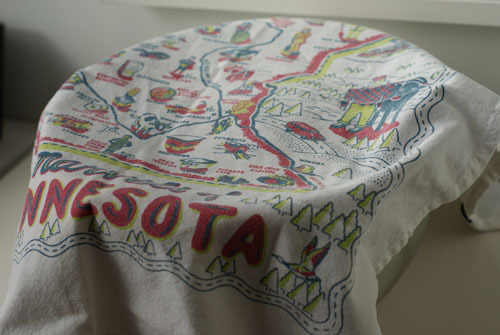 Cover with a cloth and let it sit for 30-45 minutes during which time you can go for a run, have breakfast, read the paper, take a shower, whatever. When you come back, the dough should be big and bubbly. Now, mix in your 3 tablespoons of melted butter and the second 1/3 c. of honey. As you stir, the dough will fall a bit. No worries. Next, start to add the whole wheat flour a cup at a time. After two cups, you should be able to turn it out onto a floured surface where you can start to knead in the rest of the whole wheat flour. 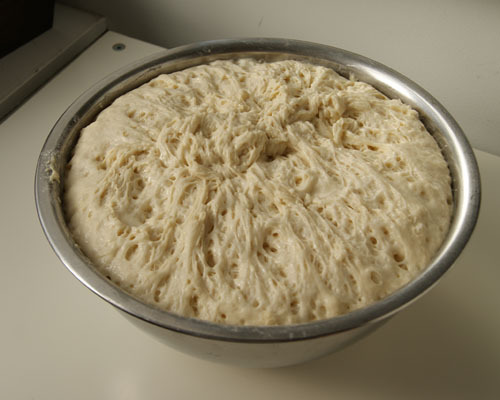 This is where you get to know your dough – you want it to be elastic enough to spring back out if you poke your finger into it. I usually knead it for about 8 – 10 minutes. 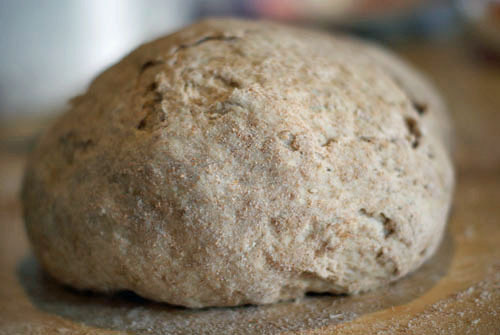 It’s the kneading that activates the gluten in the flour and gives it its texture. Depending on circumstances, you can add another 2-4 cups of flour until the dough has some body, but is still sticky to the touch. Butter up a bowl and place your dough in side, turning it over the entire surface gets good and greased up. Cover with a towel and let it sit in a warm-ish place for 1 1/2 – 2 hours until it has doubled. During this time, you can: go on that run, clean up your house or catch up on the last three episodes of Modern Family you have on your DVR. Wow, time flies right? Suddenly your dough has risen and you realize you’ve spent the last two hours on Facebook! Now is the time to shape your dough into three loaves. Punch your dough down (note: kids somehow love to do this) and knead it a little bit. Next, take a knife and divide it into three equal parts. 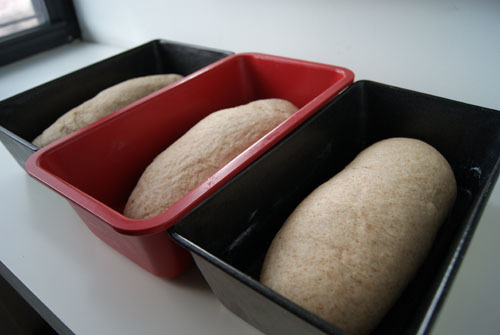 There are a number of ways to make a loaf, but I usually flatten my dough into a rectangle the width of the loaf pan and then roll it up into a loaf, folding the ends down. Place the loaf, seam side down into a greased loaf pan. 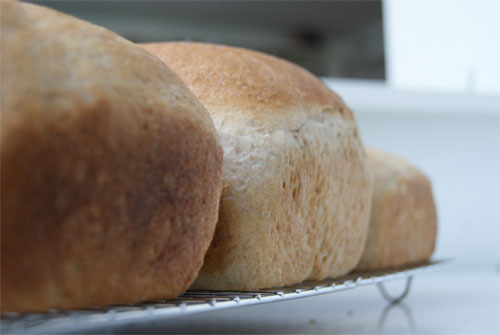 Cover your loaves with a cloth and let them sit in a warm place until they have risen above the top of the loaf pan. Depending on the weather, this can take anywhere from 1 1/2 – 3 hours. By this I mean, if you let it go longer than 1 1/2 hours, nothing bad will happen. This is your last chance to do something worthwhile this morning! Besides the making of the bread, I mean. Organize your closet. Call your mother. Play UNO with children. Write that screenplay. Preheat the oven to 350° (close to the end of the rise). Bake for 25 – 30 minutes, making sure not to over bake. It was through the process of weekly bread-making that I came to realize that my oven is actually 50° hotter than it says on the knob. I was frustrated by over-baked bread until I got myself an oven thermometer and solved this mystery. When the bread is perfect, take it out of the oven and cool completely before eating. While it’s cooling, you can whip up some fresh butter, if you’re really feeling it. With three loaves, we eat one right while it’s fresh, freeze the second, and give away the third. The random giving away of fresh bread just doesn’t happen as much as it should these days, so let the change start with you! P.S. It is ironic that I am writing this post, as I have just found out I may have a gluten intolerance and need to lay off of all things gluten for the next three months, if not forever. Bummer, right? But that doesn’t mean you have to, so take up the torch and go out there and make some bread! In the meantime, I will be perusing my new favorite blog, Gluten-free Girl and the Chef, and exploring the brave new world of teff, amaranth and millet. She makes it sound awesome, so please let that be true. Don’t worry, I still have a few gluten-y things up my sleeve to share, but I will also be writing about my new adventures in the gluten-free world, too. Wish me luck. This entry was posted on May 14, 2011, 4:35 pm and is filed under kitchen, Recipe. You can follow any responses to this entry through RSS 2.0. You can leave a response, or trackback from your own site. Your PS read my mind! there is nothing I love better than baking bread. it just makes me happy. It took me a while to get it down but now I can make a pretty good loaf. I want to try sourdough one day.